“Out with the old”, so it goes! Snip by snip, grape growers start trimming back last year’s wilted wood of dormant vines, stripped of their leaves by the wind and donning only bare cane shoots in their skimpy canopies. Like winemaking, this wood-clipping act is an interplay of reasoning, experience and knowledge that will determine the size of the next harvest and the quality of the new wine. Mindful of the importance of this annual practice, the Delicata team organises workshops for the farmers that partake in the winery’s ‘Vines for Wines’ scheme for sustainable viticulture. About 150 grape growers attended this month’s sessions which were expertly delivered by the winery’s viticulturist Jonathan Falzon and award-winning winemaker Matthew Delicata. The main topics focused on effective modern cane and spur pruning techniques and their benefits for the vines, the vignerons and the winery. The paybacks of smart dormant vine pruning are many: the plants suffer less from fungal diseases, live healthier and longer, require less irrigation and yet yield a consistently better crop of properly ripened grapes with optimum aromas and colour for which the winemaker pays higher prices. 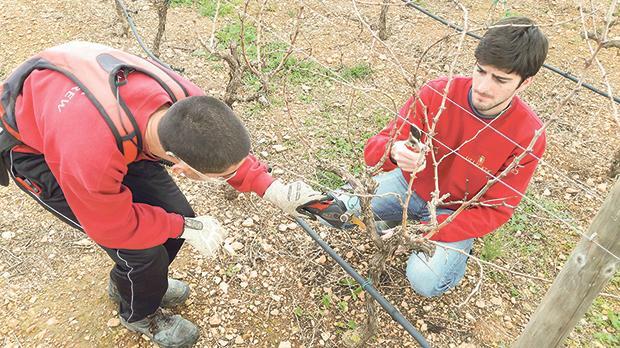 With nearly one million vines to prune, Maltese and Gozitan farmers will continue the hard work until the end of February or early March. During the winter months, the remaining trunks and roots conserve energy and hoard valuable carbohydrate reserves. These will prove vital in spring when the vines awaken, bud and dress up in leafy-green again. In today’s highly competitive global wine market, sustainable viticulture is critical for success. Pruning and other vineyard quality management procedures save costs for the vignerons and yield better quality grapes for Delicata’s sought-after boutique bottles. Pruning season is also that time of year when the first wines made from last summer’s grapes get released for sale. “In with the new”, it is! At the Delicata winery, super-fresh wines of the 2018 vintage certified as IĠT Maltese Islands, such as the Pjazza Regina collection and the semi-sparkling Girgentina and Ġellewża Frizzantes, are rolling out to refill a domestic market that’s thirsty for well-made local wines. When it comes to the sale of white and pink wines of the DOK Malta or DOK Gozo appellations, the law imposes an embargo. The official protocols forbid their commercialisation before December 1 following the harvest. That’s why, although good and ready for distribution earlier, wines like Delicata’s 2018 DOK Malta white blends of Chardonnay and Girgentina, Vermentino and Zibibbo, the pink duo of Grenache and Cabernet in the Medina selection and the DOK Gozo Victoria Heights Chardonnay had to be kept back. But they have been released now and their arrival this side of Christmas is particularly cheerful news for wine enthusiasts who like their wines as fresh as possible and many catering establishments who have been patiently waiting to replenish much-asked-for stock. Lovers of red wines wanting to get their hands on a bottle of the latest 2018 vintage will have to wait a bit longer, though. Unfortunately, DOK Malta and Gozo wines of the red typology may not be sold before March 1. Do the 2018 vintage wines live up to expectations? Are they well worth putting on your bucket list for next year? A great resolution will be to find out. Georges Meekers is Delicata’s headof sales and an award-winning wine writer.